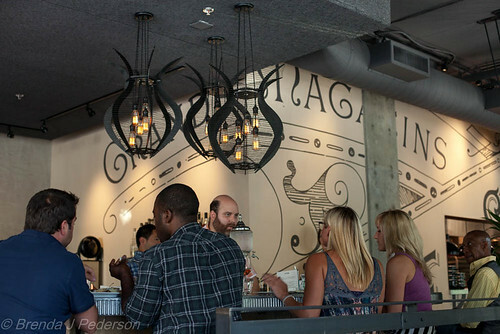 It’s hard keeping up with all the new places opening – especially on Capitol Hill! It almost makes me want to move to the area so it would be easier to visit them all on a regular basis. Almost….. Le Zinc bills itself as a French gastro-pub and opened only about three weeks ago. I was a little hesitant about visiting, as Le Zinc is owned by the same folks who own Maximilien in the Market. I love Maximilien’s deck but have found the food a little hit or miss over the years. But last night a friend and I popped in about 5:00pm for the Le Zinc Happy hour. I love the design of this new place. Low tables surrounded by groups of chairs fill the bar area – very cozy and relaxed. The bar itself is very handsome with gorgeous hanging light fixtures, stools and what I assume is a zinc top. The dining area sits a few steps below the bar and is further divided from the bar by an interesting sculptural metal piece. Apparently the architect designed and built some of the more unique elements in the restaurant. Several appetizers and small plates dominate the menu with a smaller selection of main courses backing them up. The selection of steamed mussels, however, is what caught my eye. They offer four different preparations – two traditional options and two with a twist. Lucky for me during Happy Hour all mussels are half price. We started with Happy Hour wines – at $3 per glass I wasn’t sure what to expect. The rosé was very pleasant and crisp. We ordered Moules Marinière and Moules NW, along with a side of frites for our dinner. 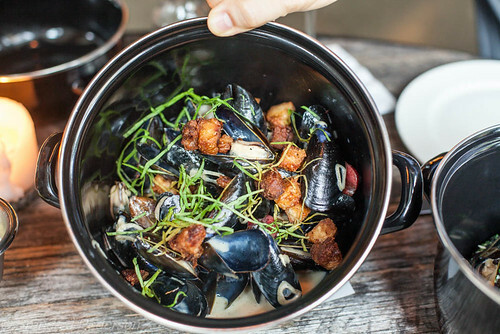 The mussels arrived in traditional two-part, black mussel pots and were full-sized, generous portions. The Marinière – which two staff members told us were their favorites – were good and as you’d expect this traditional dish to taste. My only complaint was that we didn’t order bread so an awful lot of beautiful broth went to waste! The Moules NW were steamed with Bing cherries, brandy, cream, sorrel, shallots, and crispy pork belly. Kind of a crazy combination but it works. I especially loved the sweet cherries paired with the savory bits. 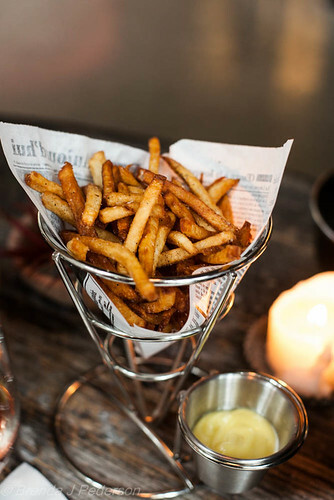 The fries were delicious and delivered in the same holders they use at Maximilien. 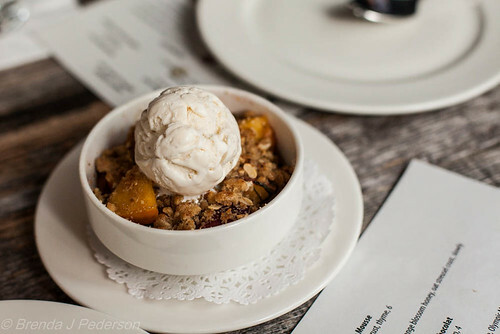 We ended the meal with a peach crisp topped with ice cream. At 5:00pm we had no trouble snagging a table and there was plenty of room at the bar, too. But by 6:30pm we noticed people being turned away at the reception stand. 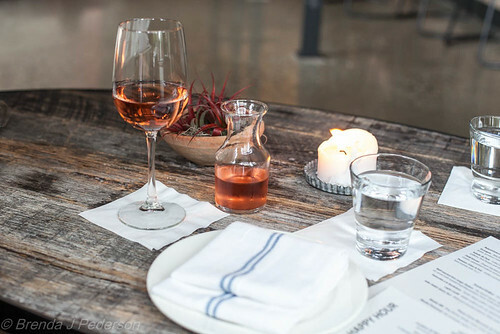 Le Zinc seems to already be a neighborhood favorite. Perhaps the friendly staff has contributed to the popularity, too. Le Zinc is definitely a great Happy Hour spot. It’ll be interesting to try some of the other menu items in the future.